I don't see this as brilliant or funny and know that those who mock Christianity can do this until they think God will not punish them. So sad, but if they have heard the plan of Salvation and reject it, that is their decision. Even sadder that AARP is allowing this to be promoted. I guess they don't care if Christians do not join or promote AARP. Even sadder that AARP is allowing this to be promoted. I guess they don't care if Christians do not join or promote AARP. I don't see this as brilliant or funny ....that's great. I for one appreciate your opinion, though I vehemently disagree. God has a sense of humor.....and look who I'm telling.....a part-time comedian. Do you think God appreciates those attacking minorities? Immigrants? Or complaints about "germs" or "trash" at the border? What about those who embrace a liar, a bigot and adulterer. Is God cool with that? I couldn't find a reference in the bible. It weeds out the hypocrites and frauds. I don't see anyone "well-served" by ignoring the hypocrisy and sweeping it under the rug. Do you? Exposing a 'faux Christian" is not "mocking Christianity". Exposing hypocrisy among certain Christians or anyone else is not "mocking Christianity". Those who expose hypocrisy haven't necessarily "rejected" the "plan of Salvation". AARP sticks to Freedom of Speech and a person's right to believe or not believe what they want as individuals, although it seems that certain people here might want AARP to only accept people of a certain religious belief. I look upon God's grace, not his "punishing". I also believe in loving everyone and forgiving everyone, not just Christians. 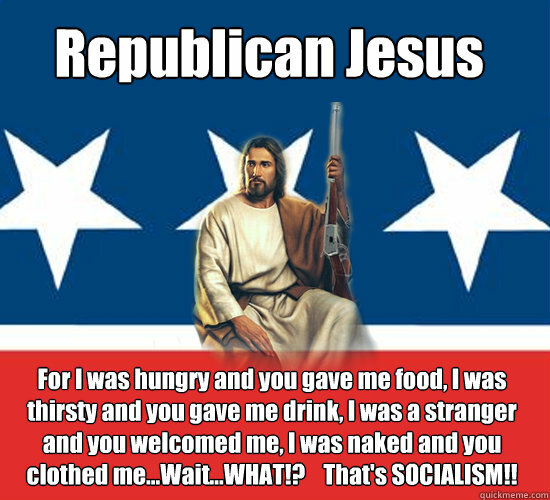 "Let's Pretend We're Christians and Fool `Em"
Fortunately, Jesus would never have considered being a republican. Excellent cartoon, Chas! Very illustrative of "Let's Pretend" we're Christians......we'll fool other's like us.....pathetic!!! They aren't fooling people who are of another faith.